Dogs Love Running!, a professional pet franchise in the dog walking industry, answers common and timely pet business questions in their free pet business blog. 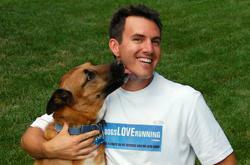 John Reh, president of Dogs Love Running! Franchising, Inc.
"How much to charge for dog walking?" Our blog covers that and more. With the Spring season now officially here, it's a time when people start to regularly get back outdoors with their pets and enjoy the warming weather. It's also a time when interest in starting an outdoors-related business starts growing and more people are looking for information on how to start a business that enables them to work with dogs, cats, and other animals for a living. Dogs Love Running!, experts in the pet franchise service industry, see spikes around this part of the year on their pet blog for articles relating to starting a dog and pet-related business. They have been writing in their blog since early 2010 on all sorts of topics regarding how to successfully start, operate, and market a dog walking and pet sitting company. The pet blog mainly addresses ideas and questions regarding marketing and operating a business focusing on dog walking and pet sitting services. Other areas of discussion include adding team members, accounting, and strategy planning. Dogs Love Running! is a franchisor of their dog walking/running and pet sitting business concept. Their turn-key pet franchise is available to people in most states across the country. The Dogs Love Running! pet business blog is a free resource and can be subscribed to via email or RSS directly on the blog site. About: Dogs Love Running! helps pets live longer and behave better through exercise. They offer private dog walking/running, pet sitting, and related services at the customer’s home. They’re also a low-cost, home-based franchise with available markets across the nation.